Scientific Solutions for your Success! New clients: Please provide business address when requesting a formal quote. The methods employed in a successful surface analysis must be tailored to the analytical objective. Please contact us to help you sort through the tools available to meet your analytical objective in the most efficacious manner. Surface analysis is a general description of the study of physical and chemical properties of a material at the outer most “layers”. Depending on the target depth of the analytical needs and the information needed to be gathered will define the best analytical techniques to gather this information. The laboratory scientist must understand the limitations and advantages of each of the techniques to best present valid data and conclusions based on the information gathered. For the purpose of this discussion we will break this down into the two major informative categories: physical properties and chemical properties. Often several techniques can be used during the same analysis to garner both physical and chemical information, for which we will call “coupled” techniques and will be discussed as well. Often times we must truly focus on what defines the surface depth. As many techniques are capable of generating information at depths into the millimeter range, this is often too deep for the analytical objective. For example, we have a thin film of material on the surface of a steel sample. The film is so thin that it is not even visible under microscopic views. If we utilize a spectroscopic technique of too high of energy, we might yield too much information from the bulk of the sample thus diluting the surface information. This can lead to inconclusive or wrongly conclusive data about the chemical nature of the film. When defining our surface depth, we will typically talk in units of microns (µm, micrometer or 0.001mm). For defining a surface only a few atomic layers thick we are on the order of 0.001µm. Most ultrathin physical and chemical techniques targeted for this range will have an upper depth range of approximately 0.01µm. As we approach the higher energy chemical techniques, we get into the range of thin films which will have an upper depth range of approximately 1 µm. Finally as we pass the 1 micron depth range we are referring to a “bulk” analysis that, although is being performed at the surface, is yielding information from the bulk material below the surface. The simplest of physical properties observation at the surface is that of appearance. What does this surface look like to the naked eye? For example, we have identified a black “smudge” at the surface of a piece of steel. We note that it is black against the silver background. That in itself is an observation that there is likely a contamination that might be problematic for the application. The simple observation that we can see it indicates that we likely have significant thickness of material that is well beyond 1 um in depth. For those surface artifacts that may not be visible with the naked eye, we will resort to microscopic techniques. In almost all cases of chemical analysis, the electron is our primary friend. At the target surface we can manipulate the electrons that orbit the atoms in such a way as to make that target atom tell us what atom it is. As we provide an energy source to excite the target atoms, electrons in specific shells will be ejected based on the level of the incident energy. Several conservation mechanisms will then state what can happen to the target atoms as they return to the ground state. The ejected electrons can also interact with their own atoms and lead to additional ejections. In all cases, this is the general description of atomic spectroscopy. Many atomic spectroscopy techniques are also used to provide bulk chemical information, however for surface analysis we must concentrate on atomic spectroscopic techniques with tuned energies that will yield information from the surface or near surface. The atomic spectroscopic techniques that we routinely utilize in the lab to characterize surface and near surface spectroscopic information are listed in order of the least depth to greatest depth. We get the best insight into the observed surface when we can couple both physical properties (spatial information) along with chemical properties. If we can couple both an imaging technique with one or more spectroscopic techniques we can target bulk or very small surface features for chemical identification. In the lab we routinely utilize equipment with coupled techniques. For instance we will utilize optical microscopy along with FTIR detectors to identify the type of plastic material that is comprising fine particles on a filter pad, or identifying the resin system of different paint layers of a prepared cross-section. 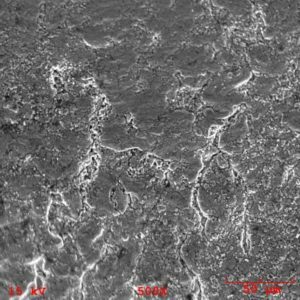 Additional we will use SEM coupled with EDS to characterize the elemental identify of a particular inclusion embedded in the surface of an aluminum casting. Have questions regarding our testing capabilities, your project needs or company information? We love to help! Contact us us today by submitting the form below. "New clients: Please provide business address when requesting a formal quote." Copyright © 2015, RTI Laboratories. All Rights Reserved.